Will we miss this luxury SUV? 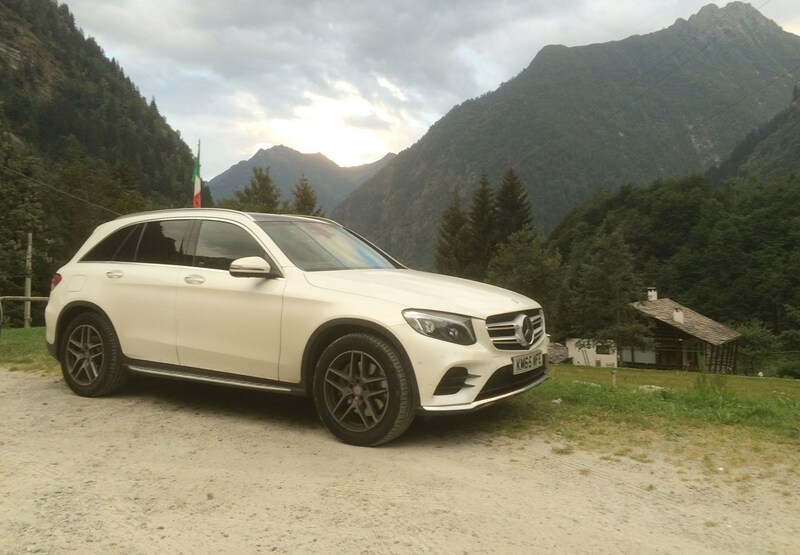 The GLC is a quiet hero, the do-everything wagon that doesn’t expect too much in return. It is a seriously comfortable mile muncher – the seats are excellent, while the adaptive cruise control and lane-keeping assist systems are the best on any car we’ve driven. The diesel engine gives just enough oomph, while the fuel economy is also highly respectable. It can be a little noisy when cold, though. Drive modes make a big difference to how the car feels; for example sport and sport+ really sharpen the gearbox and throttle responses up. It is agile enough through the bends, though fails to hides its weight when really pushing on. Adaptive high-beam assist headlights are excellent, and parking cameras are also crystal clear. 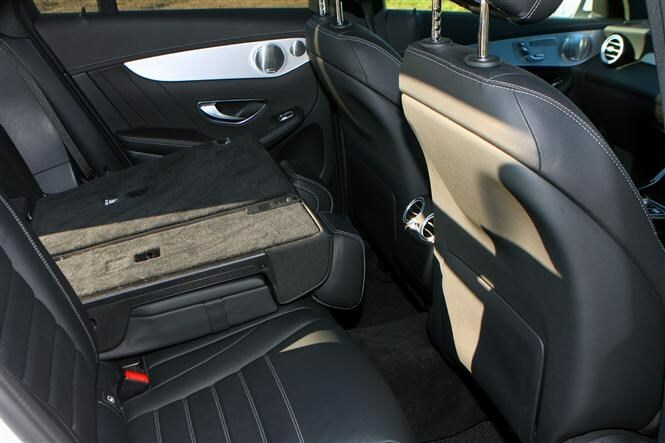 The GLC is really spacious and practical – the boot is huge, with lots of cubbyholes to store various detritus around the cabin. The infotainment system was easy to use and not too intrusive; the large main selection rotary knob makes light work of switching through options or radio stations. Were there any negatives? A few. The trim and seats frequently start creaking which is a bit of a worry – seems to be a thing on all C-Class Mercedes derivatives, on which the GLC is based. 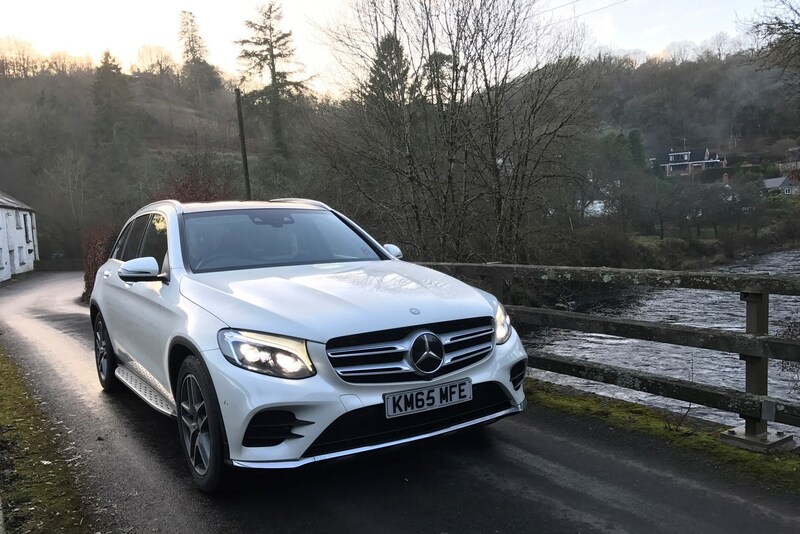 Road Test Editor Gareth Evans said: ‘Having spent a huge amount of time covering big distances in the GLC, it’s fair to say I became quite attached. Its blend of stylish cabin, intuitive safety systems and relatively agreeable running costs meant it was often the car I’d pick on the fleet if I had a big drive to do. The second-hand experience we had was second-to-none; in fact, we easily forgot this wasn’t a brand-new vehicle. We’d certainly recommend buying Approved Used Mercedes-Benz. Mercedes-Benz offers Approved Used Finance - speak to your local dealer to find out what’s available. We’ve looked at the finance options for a brand-new GLC. 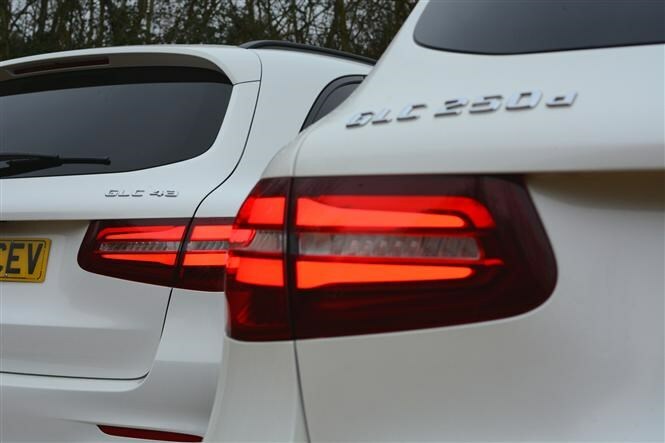 Weighing in at £40,865 before options, the GLC 250d AMG Line is pricey. Even on PCP finance, it will set you back £522 per month over three years (with a £5,000 deposit and 10,000-mile-per-year allowance). The Mercedes C-Class Estate with the same engine and all-wheel drive is just £580 cheaper but much more affordable on finance at £467 per month (with the same contract terms). 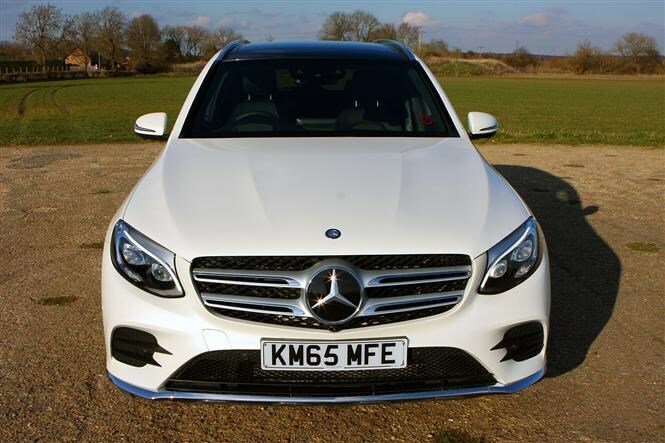 Go for the two-wheel drive C250 d AMG Line Saloon and that figure drops to a mere £412, making these the sensible choice for those who don’t need an off-roader. As for direct rivals, the GLC is undercut by the top-value Audi Q5 2.0 TDI 190 Quattro S Line S tronic at £480 per month and the £510-per-month Land Rover Discovery Sport 2.0 TD4 180 SE Tech automatic. However, it is much better value than the £589-per-month Jaguar F-Pace 20d 180 AWD R-Sport automatic and the £631 Volvo XC60 D4 AWD R-Design Nav (all with the same contract terms). Luxury, comfort, ease – the GLC has all three in spades. You’ll drive 100 miles and it will feel like 5. You might arrive at your destination more relaxed than when you started. What it lacks in raw character, it makes up with smoothness. If you want a top-class SUV, there are few better ways to spend £47k. Update 11: How dog-friendly is the GLC? What’s more difficult than keeping passengers happy on a long journey? Keeping a dog who’s prone to getting stressed in the back of cars happy on a long journey. 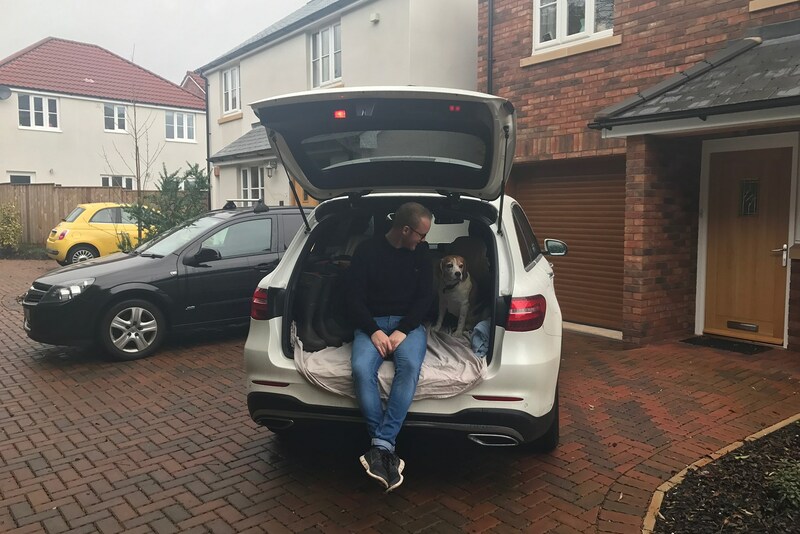 Still, a weekend of running around the countryside and on the beach was on the cards for Rufus – my in-laws’ pooch – so the GLC was drafted in for the trip to Devon. Normally, Rufus spends his car journeys in the back of a fully kitted-out dog-friendly MINI Paceman which he’s used to by now, but he still gets stressed in the back of the car so I was concerned he’d struggle in anything different. 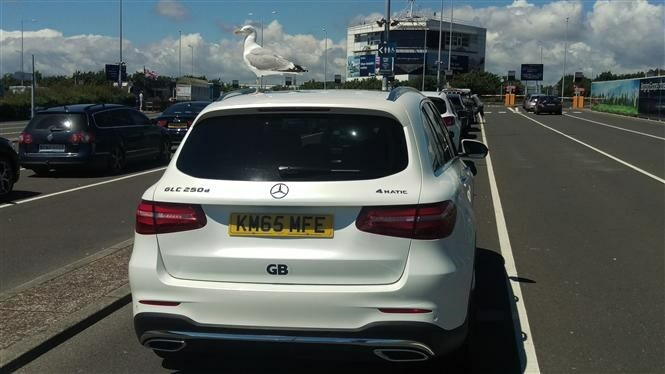 Luckily, sitting in the boot of the GLC means he’s got a good view out the back without feeling hemmed in, and the high boot floor means he can also see over the back seats and to the front if he wants reassurance he isn’t on his own. The first issue was getting him in, though – the high loading lip proved a bit too daunting at first so a helping boost was needed, but he was jumping in and out with ease by the end of the weekend. 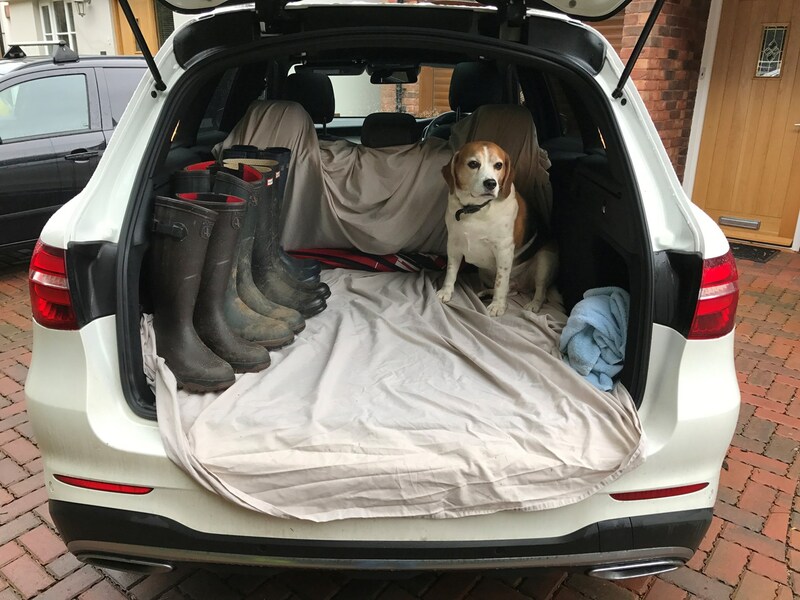 While the GLC was as relaxing and refined as ever on the 200-mile journey south west, its practicality credentials were put to the test, too – fitting five people, a dog, coats and wellies in with ease. It manages to blend being very spacious on the inside – there were no complaints from my passengers – but not too cumbersome to pilot along narrow lanes or navigating tiny car parks. I found it to be surprisingly manoeuvrable in a particularly tight car park. The various cameras helped with this, too - they’re of a really high quality. 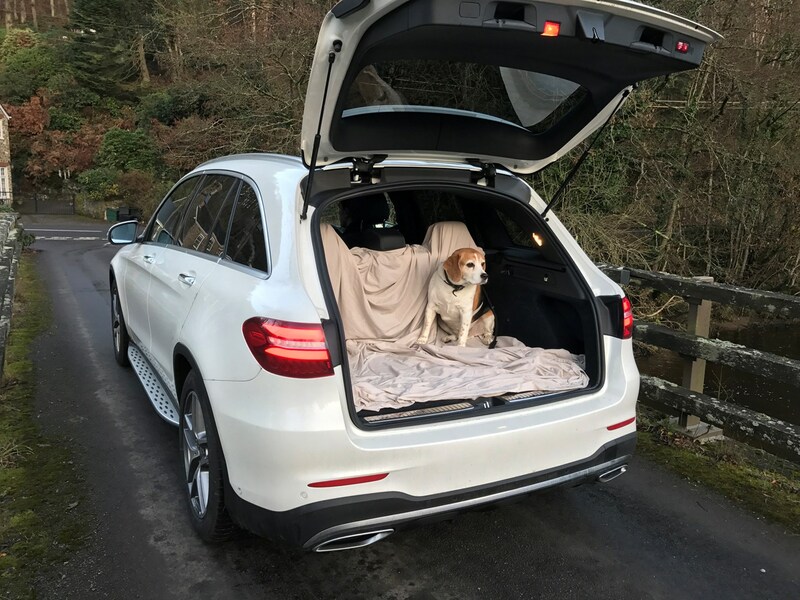 I was a bit nervous about using a big, luxurious Mercedes SUV for a countryside adventure in the middle of winter – the thought of getting mud and dog hair out at the end of it filled me with dread (hence the old bed sheet draped across the inside). Luckily, only a few made their way through to the boot floor which, rather usefully, is easy to remove altogether and the material is very easy to just run over with a brush to get rid of any excess. All in all though, the GLC was faultless at dealing with the tasks I threw at it. My main concern was keeping Rufus happy and, while there was some panting for parts of the journey, he seemed calm for the majority and wasn’t reluctant to get back in again after a couple of pit-stops along the way – he even settled down into his bed for a while, which never normally happens. Having joined Team Parkers in January 2017, I was lucky enough to be thrown the keys to this £47k GLC as my first long-term test car. After my first full week testing this SUV, I finally seemed to get the hang of the vast array of technology available in this car. I don’t think I’ve driven any vehicle with such advanced assistance systems, and at first glance, it’s truly overwhelming. 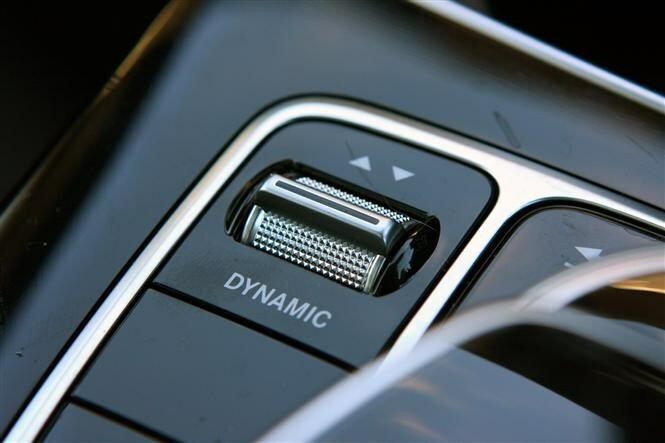 There’s no denying that Mercedes-Benz is at the forefront of assistance technology, and you certainly feel in safe hands. However, driving the GLC feels too easy. The systems are so intuitive and expert that I feel inadequate as a driver, and indeed as if I am superfluous to the experience. While some might enjoy not having to think too hard about their journey, I feel I’m missing out on the driving experience in this car. 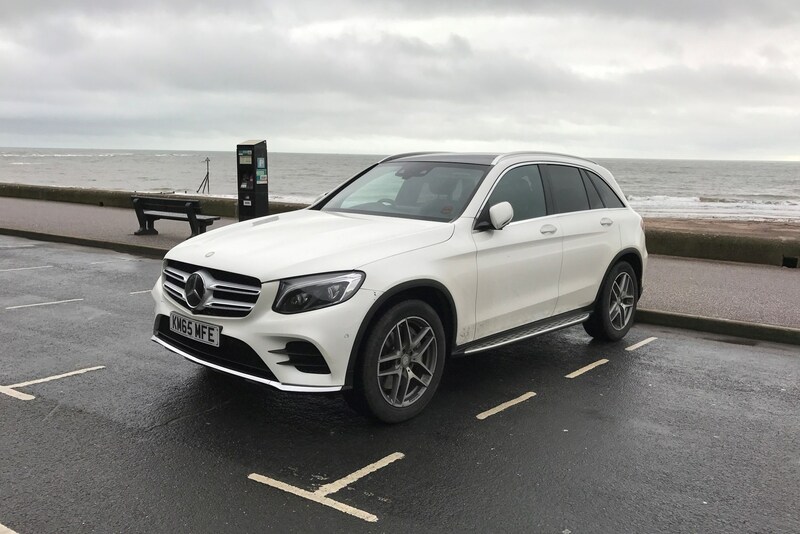 I suspect the GLC is suited to those driving long distances, or doing frequent taxi trips with lots of children, for whom driving has become a bit of a chore. Lane assist takes the tiredness out of long journeys without being intrusive, while the warnings about under- and over-taking cars keeps you alert without realising. The luxurious ease of journeys in the GLC means you’re happy to volunteer to drive the kids anywhere – but it’s not because you’re excited about the prospect, more that you know it’ll be a breeze. OK, the GLC didn’t remind me to do my taxes, but it won’t be long until the technology exists to sync your car with your diary and set reminders (the Mercedes E-Class is due to have such features introduced later this year, and you can already get BMW Connected). The GLC might not have made me smile while driving it, but I’m smiling when I get out of the car at the end of my journey. Pot holes? What pot holes? I’ve been impressed with the GLC’s handling of pot holes and country lanes. I floated along on a trip to the National Trust property Lyveden New Bield down a bumpy back road, the GLC eating up pot holes with glee. I admit to feeling a bit smug flying over the speed bumps without a hair out of place. 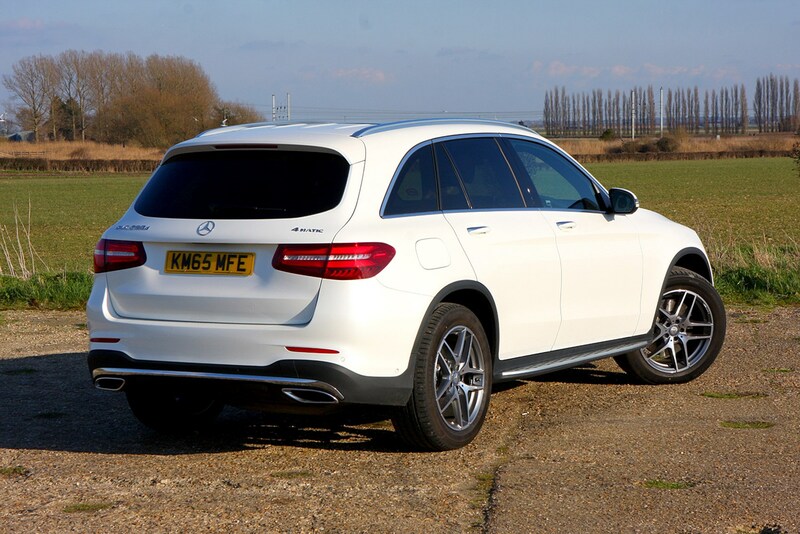 To read the full Mercedes-Benz GLC review, click here. I had a trip to the dealers with the GLC this week, as the batteries ran out on the key fob. The service was second-to-none – as expected – and I was in and out within 5 minutes with two shiny new batteries for just £9.84. At just over 20k on the clock, I wondered if this was a bit soon for the battery to die – but the chap in the parts department said some can last years, while he’s had to replace one within just a few weeks. But you don’t mind too much when the service is quick, easy, and cheerful. 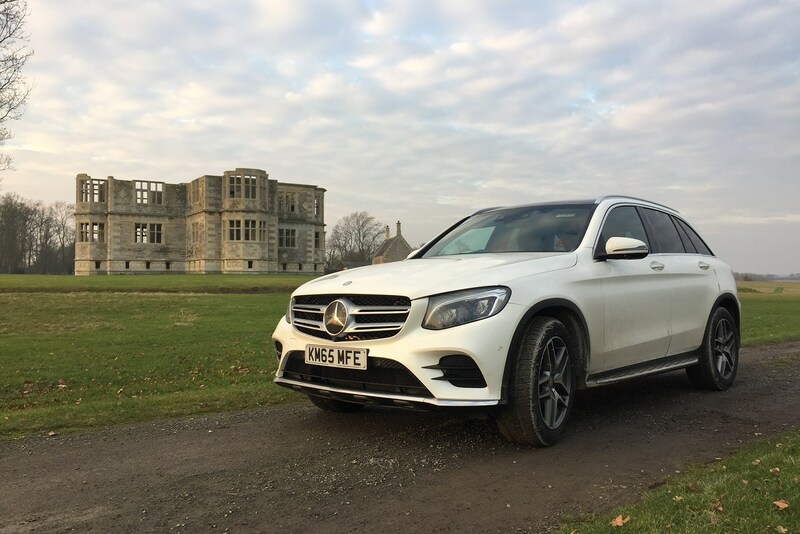 Our GLC is a fantastic car in many ways, but it’s not what you’d call fast. Does anyone need an SUV that does 0-62mph in less than five seconds? 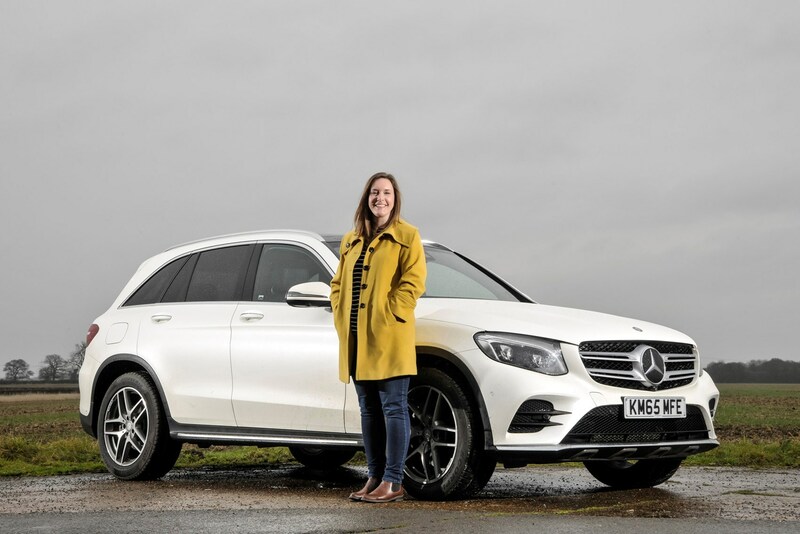 We grabbed the keys to Mercedes’ quickest version – the GLC 43 4Matic – to find out whether it’s worth spending another £8,280 on the performance model. 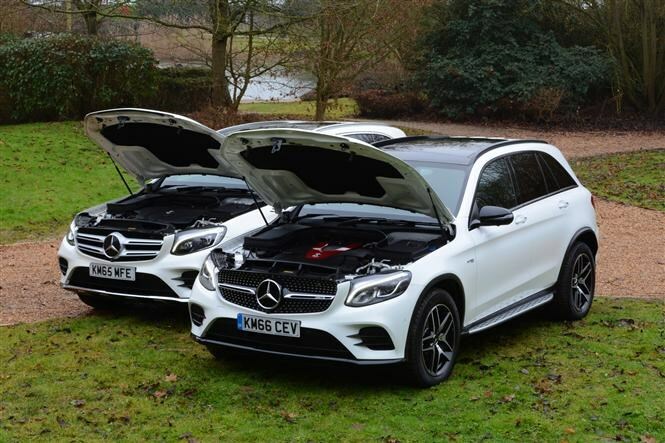 The GLC 43 has a very good powerplant under its bonnet. First appearing in the SLC 43 sports car, the 3.0-litre twin-turbo V6 petrol engine generates an impressive 367hp and 520Nm of torque, sounding very sporty along the way. Thing is, we simply can’t work out why you’d bother. The engine’s performance seems at odds with the soft, high-riding, easy-going nature of the GLC. During our time with most SUVs they’ve never been at their best driven quickly, and the 43 is no exception. The standard air suspension doesn’t seem to match with the car’s character either. We like the idea of adjustability between soft and hard ride, but in application the more comfortable setting introduces an annoying tendency for the suspension to refuse to settle down. Small bumps cause vibrations through the cabin that continue for longer than would be usual on a steel-sprung car, so on a motorway the GLC feels like it’s constantly moving. We ended up leaving the 43 in its firmer setting, which isn’t as comfortable as the non-adjustable set-up on our long-termer. 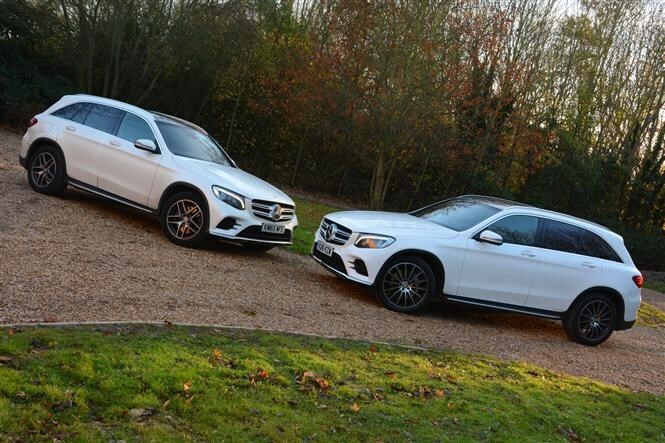 There’s no big difference between the cabins of our long-term GLC and the 43. In fact, since both have the Premium Plus package and ours has a fake-leather dash and seats, some may prefer the interior of the cheaper car. 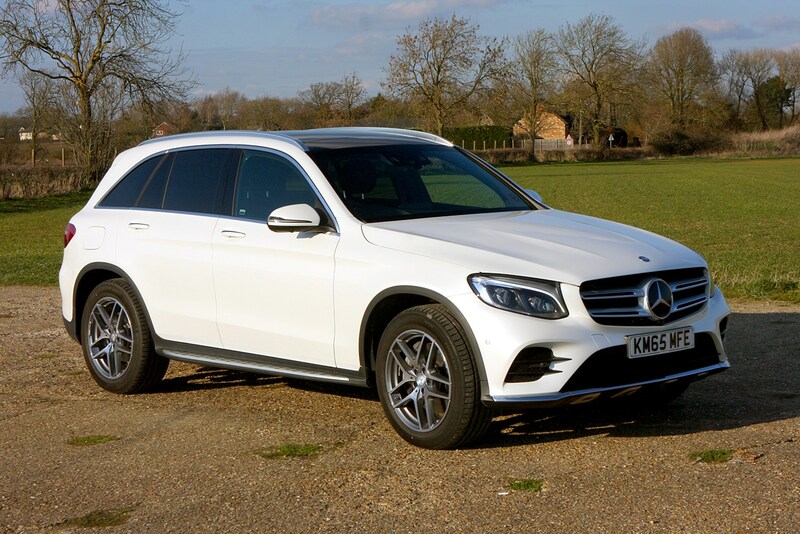 The price gap shrinks a little with the addition of the Driving Assistance Package on our GLC 250 d, however, but it’s something we’ve really grown to love about it. 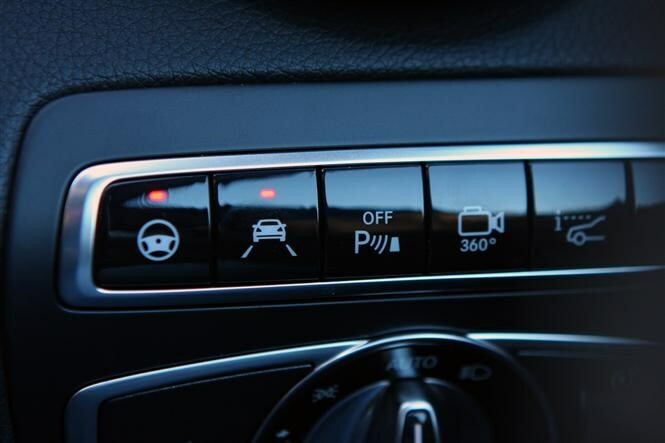 The active safety systems work so well together than it makes driving a lot more relaxing – and what’s more all of the controls are conveniently laid-out so they’re easy enough to switch off if required. One thing the 43 does have in its favour is the automatic parking system, though. This really does make like easier in supermarket carparks or when you have to pull off a tight parallel-parking manoeuvre. Clearly the biggest difference on the outside of the GLCs is the front grille design. Our 250 d sports a more classical design with a pair of chrome-trimmed louvres, while the 43 has a more modern diamond grille look with chrome pins, adding a sportier front profile. While they’re different styles, the alloy wheels on both cars measure 19 inches in diameter. The 43’s have a slightly wider contact patch with the road, but this isn’t noticeable unless you get under the car with a ruler. Both models have a fetching AMG bodykit as standard and optional £450 running boards, which we think help the GLC look far more like a grown-up SUV. On the whole, we’re happy with our GLC 250 d’s spec. After all optional extras have been considered, the price difference between the two cars is £5,450, but considering ours has the extra driver assistance tech and we can’t see the point of the extra performance gear on the 43, it makes for a better SUV all-round. Clearly, faster isn’t always better. Suspension choices are a bit complicated in the Mercedes-Benz GLC. Our AMG Line model gets a sports set up tuned by its namesake while, SE and, er, Sport trims come with a more comfort-focused option. There’s no difference in ride height but our car is noticeably stiffer. There are two further options – the Off-Road Package that bumps the ride height up by 20mm (only available on Sport grade) and Air Body Control (ABC) air suspension – a £1,495 upgrade you can pick across the range. Tick this box and you trade the normal steel suspension springs for a luxury air-sprung system not often seen on an SUV, save for the Porsche Macan. 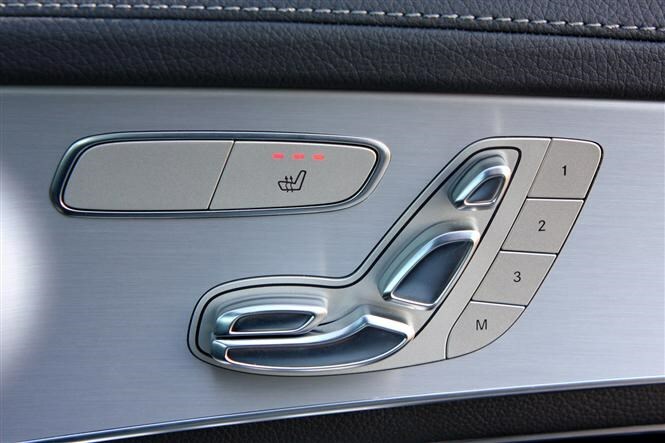 You’re more likely to encounter it on a big limo like the S-Class. While some things are easy to be unequivocal about, its’s safe to say this system didn’t win over the entire Parkers team. Set to Comfort mode it’s great on a cruise but gets a bit roly-poly when you turn the steering wheel. Add in some lumpy tarmac and the result is a nauseatingly floaty sensation that will have you reaching for the Sport setting to tie it down a bit. At this point it feels just as stiff as the steel springs. It’s not a bad addition for solo motorway miles but it made several passengers not usually afflicted by car sickness demand a firmer setting, to avoid redecorating the interior with an imminent technicolour yawn. To be honest we think our long termer’s ride, even with its large 19-inch wheels and sportier setup, is perfectly acceptable. Unless you spend your life alone on the motorway, the air suspension is not an entirely compelling upgrade. 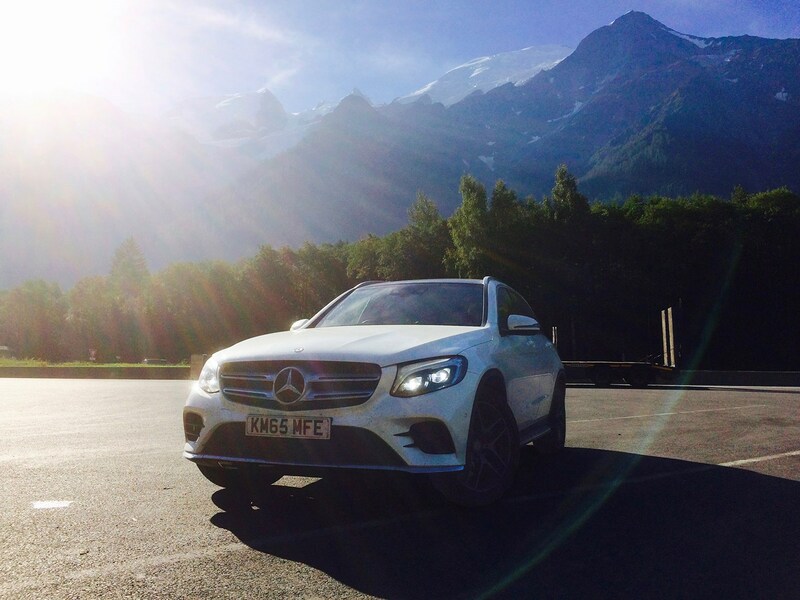 There really was only one contender for an autumn getaway across continental Europe: the Mercedes-Benz GLC is surely the car on the Parkers daily driver fleet with the keenest mix of luxury and long-legged cruising ability. Keys snaffled, Euro-insurance arranged and iPads fully charged, we were ready for a proper road trip designed to test the Merc’s family-friendliness. 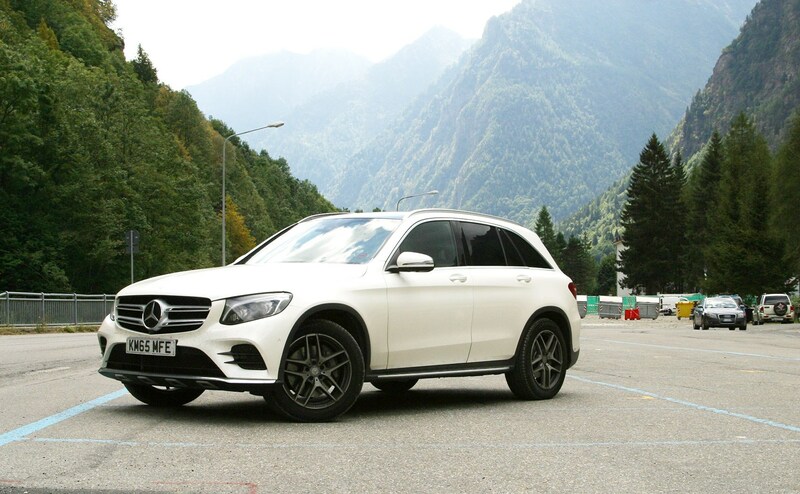 This was our longest drive yet in the GLC and one talent shone through: it’s right-sized. 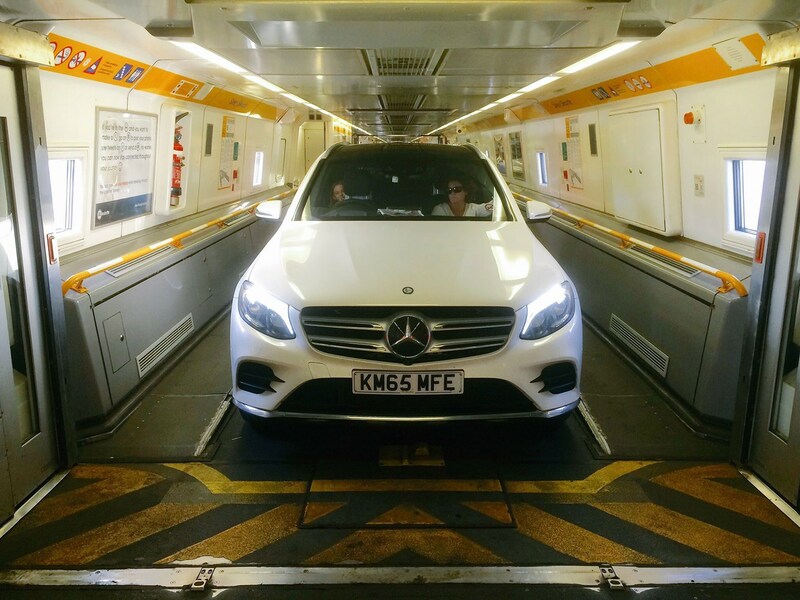 Not too big to fit in a Eurotunnel train (we’ve driven chubbier Volvo XC90s and Range Rovers through the Chunnel and it’s a real squeeze, believe us) and it never once felt too big for threading up Alpine passes. And yet there’s space aplenty for all the paraphernalia needed to transport a family of four on holiday. Our earlier report discusses boot space, but we can happily add that four grown-ups can travel in comfort - the double sunroof doesn’t intrude on rear headroom at all. One neat trick amazes every time we use it: the adaptive headlamps cleverly switch to driving on the right with no need for mucky stickers or converters. 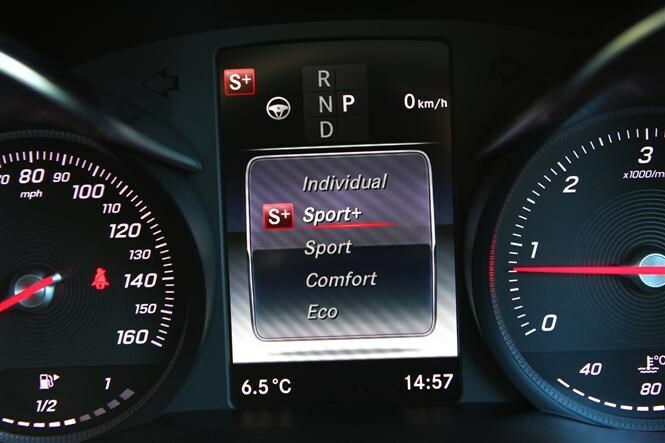 Merely dip into an onboard computer menu and select continental touring mode. The Merc GLC’s lights are in fact brilliant all-round; they dip automatically by spotting oncoming traffic, shuttering parts of the beam to avoid blinding other motorists. It’s like driving a sci-fi computer game, the algorithm massaging the light in real-time. A joy to watch - and it works effectively, turning night into day on pitch black French autoroutes. 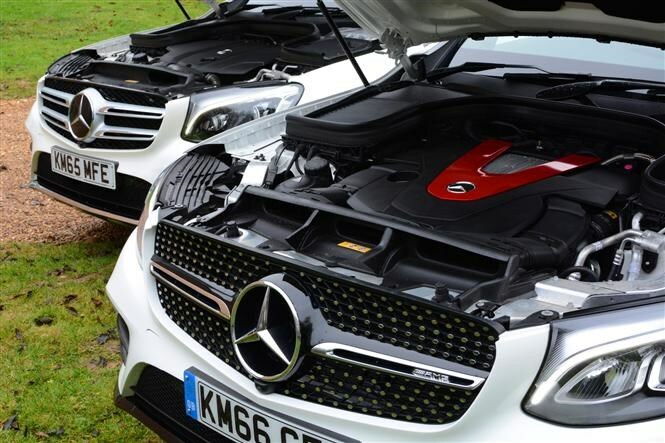 Details like this characterise the GLC’s strengths. It’s a polished performer in every regard - from the well-resolved sat-nav mapping (crystal clear across the UK, France and Italy) to intelligent cruise control and Active Lane-Keeping Assist (subtly nudges you into lane) and lovely metal gearchange paddles (so much better than the flimsy plastic ones in a Jaguar F-Pace). So we cruised across the autoroutes of France and into the hills of northern Italy, our bladders and stomachs requiring emptying and filling before the GLC did. It rides well, even when full to the gunwales of holiday clobber, and the 250 d engine is a quiet cruiser, compared with the more vocal F-Pace 2.0D. Only on mountainous stretches around Mont Blanc did we wish for a bigger engine; four-up and loaded with luggage, we had to resist overtakes on some hillier sections. What else would we change? Not much, to be honest. The interior design is spot-on (though Merc’s Amtico fake leather feels a bit cheap compared with plusher hides in some rivals) and our car wears its mileage lightly. Given a full valet on return to Blighty, this year-old secondhand example looked and felt like a brand new car again. Which is a resounding vote of confidence in Mercedes’ approved used scheme. 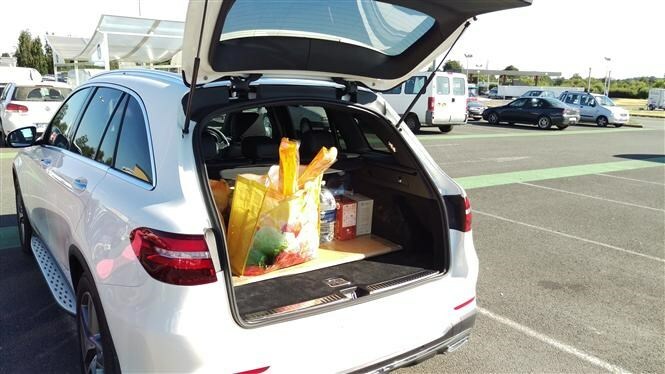 A shopping trip in the GLC in preparation for a party gave us a chance to test out its boot capacity. Car companies try to help buyers by quoting their models' luggage space in litres, which allows you to compare models with one another, but in the real world these figures are completely irrelevant. 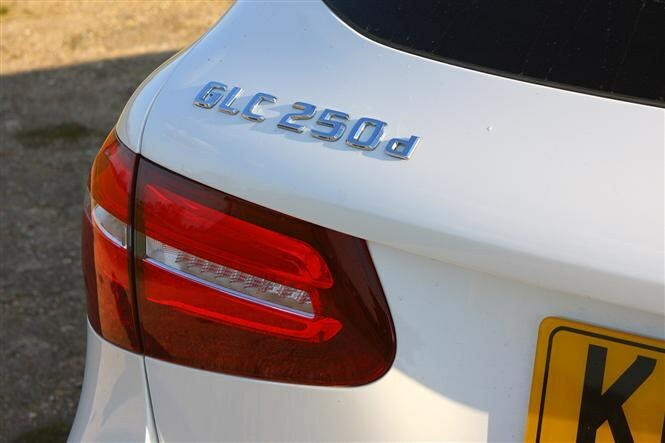 What on earth does the GLC’s 550 litres actually mean? It’s clear we could have fitted significantly more stuff in there, too. It’s yet another of the GLC’s talents. If 550 litres isn't enough, you can use the buttons in the boot to fold the rear seats down flat, which liberates a total of 1,600 litres of room. The seats also fold in a 40:20:40 split, meaning the reach bench is composed of three sections that can be independently dropped. During my time so far with the GLC I’ve learned that Mercedes is right at the forefront of driver assistance technology. In recent weeks we’ve had all sorts of cars in the office for review, and one of the biggest surprises for me was just how varied progress is on these systems. 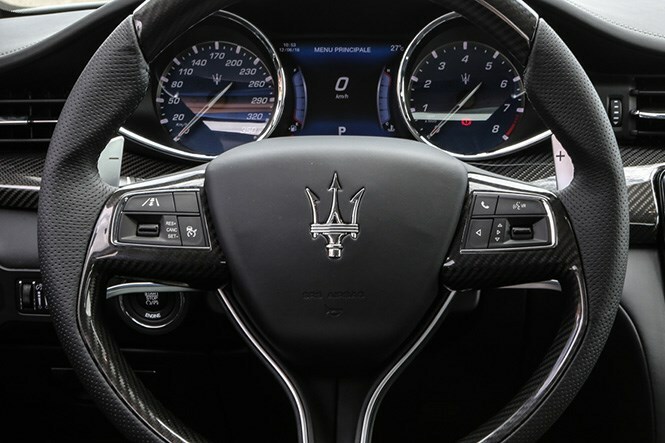 Some companies (such as Maserati - pictured above) offer only rudimentary help in the form of adaptive cruise control. The firm’s people say they don’t want the car driving for you. 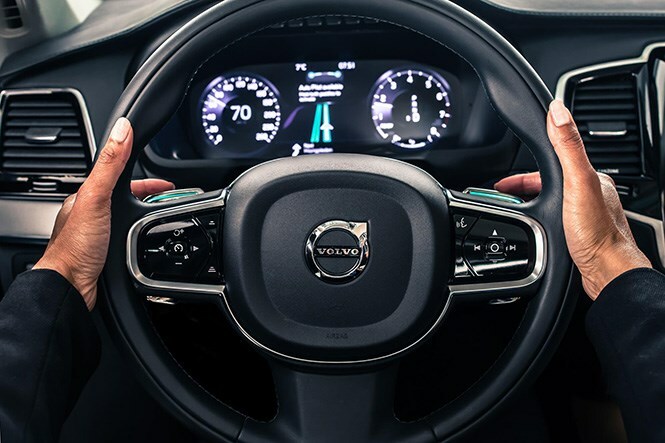 However, Volvo (pictured below) – the company proudly claiming it's aiming for no-one dying in its cars by 2020 – will sell you a V90 and S90 that can literally drive themselves up to 81mph, albeit in a manner that I found completely at odds with what I was trying to do in the car. Imagine having to wrestle with an over-active steering wheel that you feel is trying to steer you into the eighteen-wheeled truck you’re overtaking on a motorway. You’re not allowed to take your hands off the wheel, yet the car doesn’t travel on the trajectory I’d have chosen. It was far too close to other vehicles on the left-hand side, and a fight ensued until I could work out how to cancel Pilot Assist. It wasn’t fun, I didn’t trust it, and my faith in such technology took a huge hit. Even Tesla – right at the forefront of this tech and with cars already capable of fully autonomous driving – has been the subject of horror stories in the USA as the cars can’t cope with real-world driving demands. I’ve done thousands of miles using these features and my conclusion thus far is that they do exactly what they claim: they assist the driver, but without corrupting the experience. I don’t find the way the steering gently nudges you back into your lane to be intrusive, and the smooth application of the advanced cruise control means it works with the movements of other road users, rather than leaving too much of a gap or waiting that little bit too long to accelerate when pulling out into a faster-moving lane. You can’t leave the car entirely to its own devices for legal reasons, but I’m fully confident that when the time comes that you’re able to push a button, sit back and get the laptop out while the car drives you to work, a Mercedes-Benz vehicle is where you’ll want to be. I’ve yet to find a firm doing it better. Now don’t get me wrong; I’m a very keen driver indeed and love the craft of piloting a car. The GLC is a great car for it, too, for an SUV. However, I can see genuine value in this technology; because I’ve yet to find the driver who enjoys a three-mile dawdle along a congested motorway at walking pace at 8:30am. I do wish the cruise control stalk wasn’t awkwardly nestled between the indicator and steering column adjustment mushroomoid on the left-hand side of the ‘wheel, though. It’s too cluttered there and I’d have thought there were many better places to position it. I’ve not had a chance to test the GLC’s off-road capability in any great way yet, but while driving through France to a classic car event I couldn’t resist the opportunity to take a picture next to one of the cars that effectively started the public’s passion for go-anywhere vehicles. 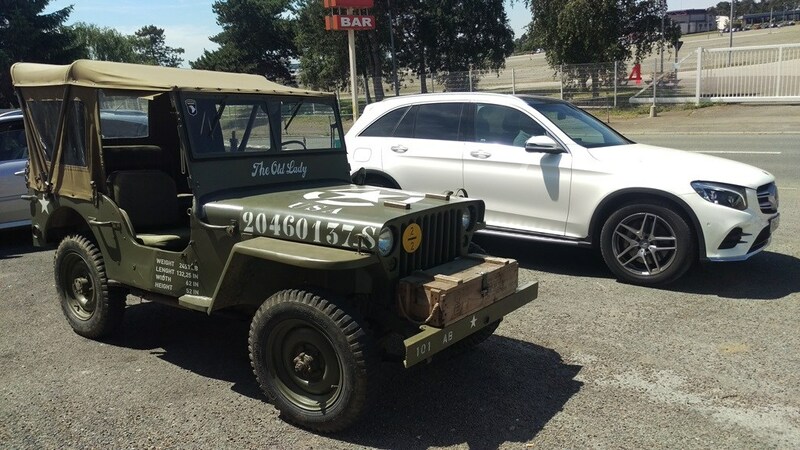 The Willys Jeep is a military vehicle and doesn’t have a huge amount in common with our Mercedes other than four-wheel drive, a steering wheel and a windscreen, but if it never existed I’d be driving around in a normal C-Class. That's because in 1948 it spawned what turned out to be the world's first SUV, the Willys-Overland Jeepster. I for one am glad it happened, because I reckon the GLC’s more interesting than a saloon. It’s also fractionally more expensive, but not by an amount that’ll break the bank. At time of writing the difference is just £230. Things have come a very long way since the '40s when the Willys went into production, but even the US Army couldn’t have guessed such vehicles would prove so popular. With that little lot installed, I’m convinced the GLC would hold its own against any rival when the going gets tough. In reality most will never stray off the tarmac, however, so it’s a good job it’s impressive there too. We’ve put over a thousand miles under the tyres of the GLC now, and I’m pleased to report it’s been a pleasurable experience on the whole. 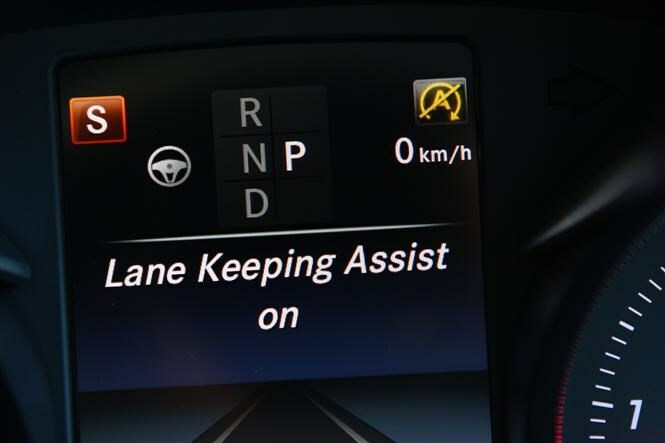 One thing I’m convinced Mercedes does better than almost any manufacturer is driver assistance technology. I’ve been making good use of this on the long motorway jaunts that comprise a lot of my weekend driving, and the combination of adaptive cruise control and lane-departure assist works so cohesively and smoothly it almost feels natural. 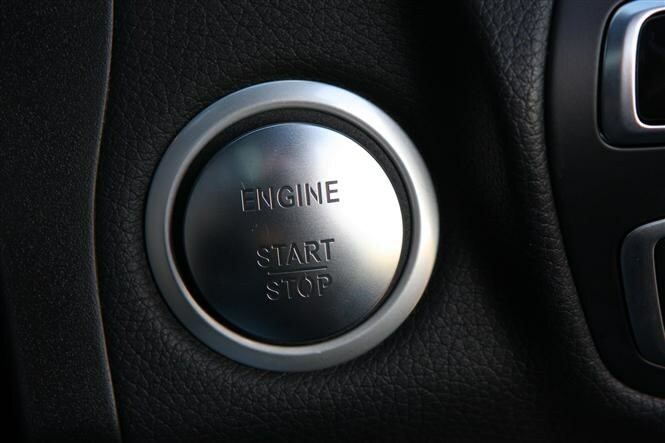 We’ve driven a number of cars in recent months that don’t do this anywhere near as well, either being too abrupt in their operation or simply not controlling the car in a manner that feels akin to a normal driver. Clearly Mercedes has put a lot of time and effort into this tech and it feels like a quality arrangement. That isn’t to say you don’t want to drive the GLC, though: if you want to take control of the entire experience it’s simple to push the car into full compliance mode – just switch off the lane-keeping feature using the button to the right of the steering wheel, don’t use the cruise control and push the posh-feeling cold metal drive mode selector control forward until the instrument panel says Sport or Sport+. Then you’re free to enjoy the other side to this SUV. It’s based on the C-Class’s platform, you see, and that means it has genuine handling capability. Sure, the body moves around more due to the higher stance, but grip levels are consistently high and there’s a balanced nature to cornering. If it’s wet and you drive too fast into a bend, the GLC doesn’t push wide at the front or the rear, which inspires confidence. I can’t wait to try it in the snow. A slightly less desirable trait of the four-wheel drive system occurs in car parks, however. The front wheels occasionally skip along the road at low speeds with some lock on the steering wheel – a result of the way the car distributes its torque between front and rear wheels – and this prompts a sudden jerk that can alarm. Our other slight criticism involves the engine. Since the cabin is so well-insulated it doesn’t seem as noisy as the same motor in other Mercedes models (the A-Class is a good example here), but it doesn’t fire up quick enough when the stop/start system disengages. This makes for jerky progress at junctions and a delay when you need a quick getaway. For both of those reasons, the first thing I do when I get in the car is switch it off, using the button just to the left of the multimedia system’s rotary control. Update 2: What's it all about? 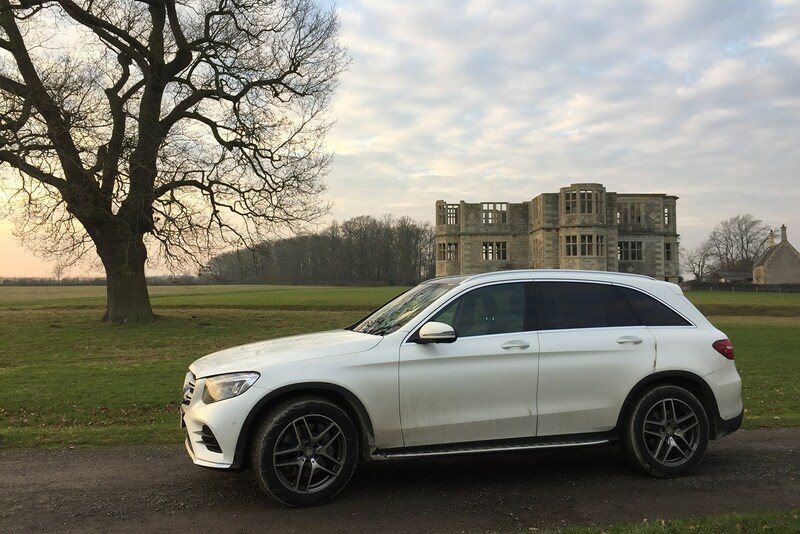 Unless you’re thinking about going for a performance model like the Mercedes-AMG GLC 43, our 250 d 4MATIC AMG Line is the best GLC-Class you can buy, sitting at the top of the range both in trim level and engine options, and also features a number of options that add to its appeal. But what on earth does all that mean? Base-spec SE cars get 17-inch alloys, Comfort suspension, a powered tailgate, automatic lights and wipers, a reversing camera, a seven-inch screen, DAB radio, cruise control, electrically adjustable front seats, fake leather upholstery, keyless ignition and climate control. You can add the Executive Pack to this for £1,295, which nets you automatic parking, sat-nav and heated front seats. That’s an impressive line-up of toys to start with, but even more compelling is Sport spec, which adds 18-inch alloys, adaptive LED headlights along with folding door mirrors, automatic parking, Garmin sat-nav and heated front seats. Finally, AMG Line gets even bigger 19-inch wheels, an AMG bodykit, sports suspension, an AMG multifunction steering wheel and all-black upholstery still finished in man-made leather Mercedes calls Artico. Disregarding the high-performance AMG GLC 43 4MATIC with its 3.0-litre V6 turbocharged petrol motor, your only choice here is power output of the same diesel motor. So as you can see, the choice of engine depends very much on how much performance you’d like. The difference between them works out at 0-62mph in 8.3 seconds or 7.6 respectively. They don’t even have different towing capacities, so that isn’t a factor. Put simply, it’ll cost you £1,100 for an extra 0.7 seconds in the traffic light Grand Prix. While that won’t matter to many people, we suspect take-up will be strong on the higher-powered 250 d. It’s well known that UK car buyers like premium model lines in cars like this, and it would be good to have the performance to match up with the toys. It doesn’t work out a massive difference in monthly payments either, if you factor it into a multi-year leasing deal as most buyers do. 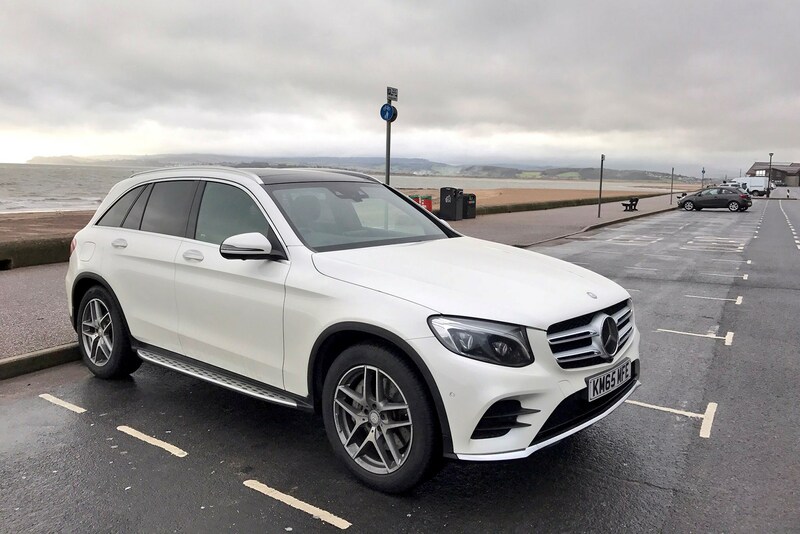 There is the equivalent of £7,895 in optional extras installed on "our" GLC, equating to one sixth of the total cost of the car on top of the range-topping AMG Line trim. While at first glance that might look extravagant, it’s far from unusual these days. Most premium manufacturers happily enjoy a 10 percent mark-up on their cars by the time the brochure has done its job. Is it worth it, though? That’s what we’re endeavouring to find out over the next six months. Stay tuned as we discover what the GLC is like to live with. 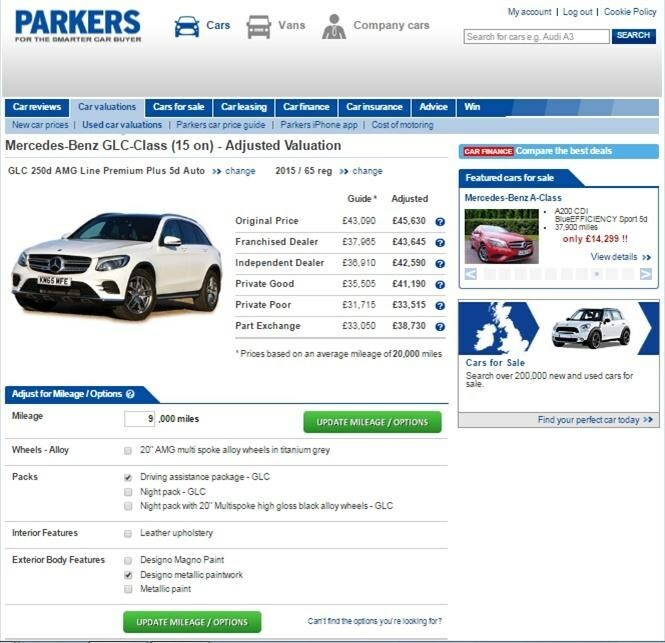 Most of the cars we deal with here on Parkers are fresh out of the factory, but that’s overlooking a vital way of saving yourself some cash – by buying nearly new. 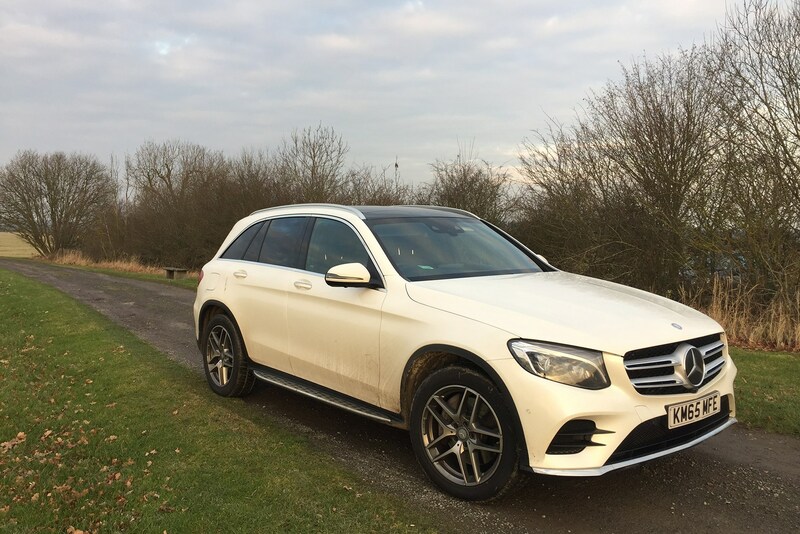 To redress the balance, we’re going to spend six months living with a used Mercedes-Benz GLC. 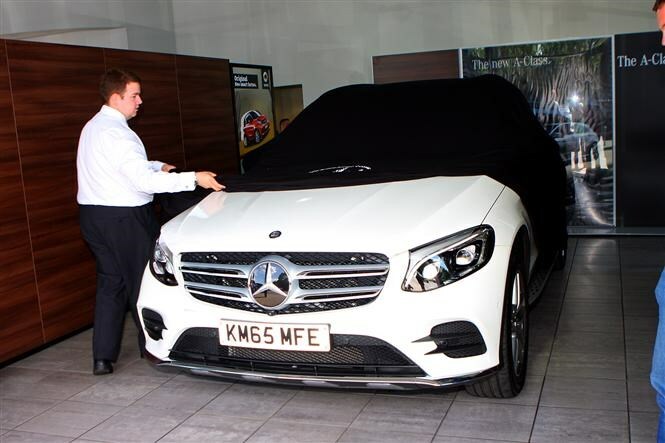 The car in question – KM65 MFE – was officially registered on 17 November 2015, making it around nine months old with just under 9,000 miles on the clock when we picked it up from the Mercedes-Benz dealership. That’s a touch below the average annual mileage we’d expect for a car like this. For that reason we went through the Approved Used Programme, so we could experience the handover and customer service to be expected when you do the same. So how much does this GLC cost? We’d gone for a tech-heavy GLC 250 d AMG Line (£39,595 list price when new) with a number of optional extras we’ll go through later, pushing the on-the-road price to £47,490. 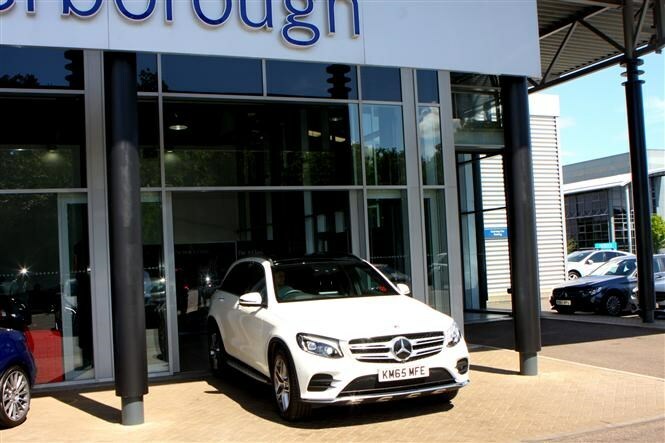 Our accurate valuations service, which can provide a free basic price or a mileage- and extras-adjusted appraisal for a small fee, shows that if we buy from a Mercedes dealer the GLC has lost £2,000 in depreciation by covering 1,000 miles per month. So this GLC would cost around £44,000 at a main dealer. Now we'd crunched the numbers, it was time to get down to the showroom. So what happens when you collect your car? 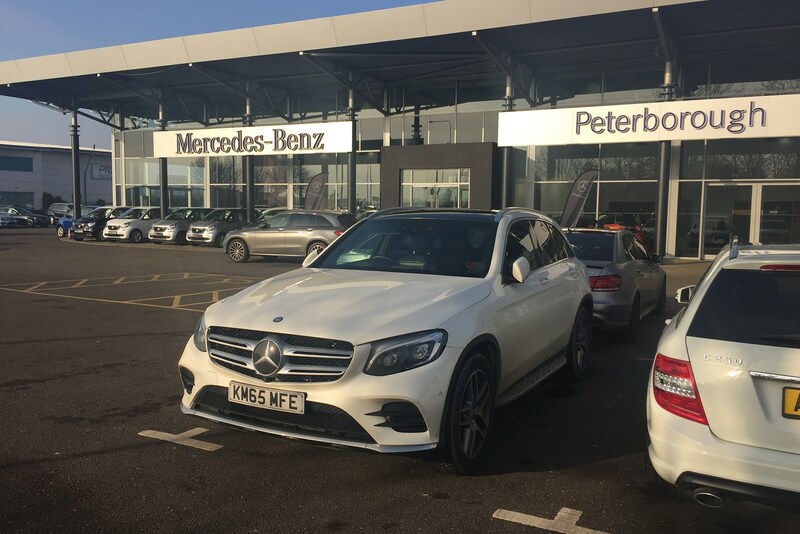 Walking off the forecourt and into the showroom at Boongate Mercedes in Peterborough, the first thing I got was a cup of coffee. 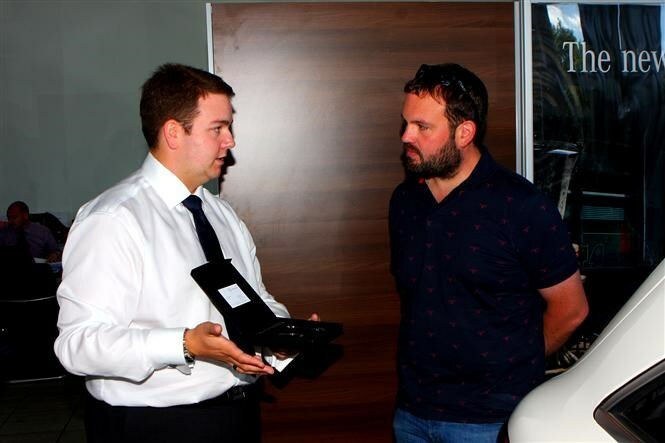 Before I’d had a chance to finish it I was met by Sales Manager Tom Broocks, whose job it was to hand over the car. After a friendly meet-and-greet I was ushered to the car handover area. This is a separate part of the showroom specifically for this task, but for approved used cars as well as brand new ones. 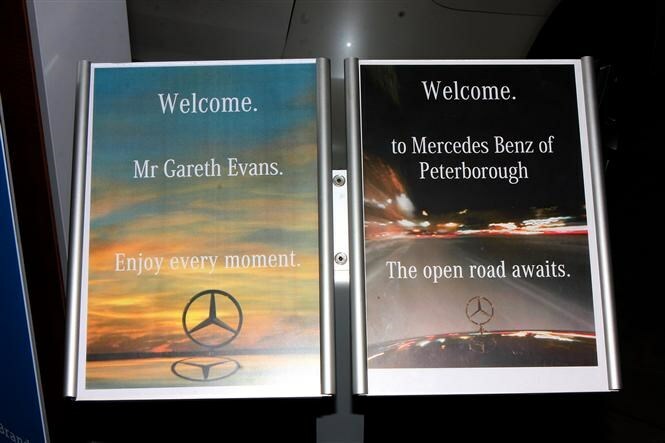 They’d even gone to the hassle of covering ‘my’ GLC in an elastic nylon sheet so I’d be treated to an official unveiling – just like a motor show - and they'd even printed some bespoke signage for me. This really did feel special. After Tom unwrapped the car, my first impression was that it looked absolutely brand new. It was spotless. This is part of the Approved Used service, you see, along with breakdown cover, a guarantee that the car’s history is clear and a full health check. Then it was time for a tour of the car. Tom took me through all of the controls, starting with the driver’s doorcard and running from right to left through the cockpit. 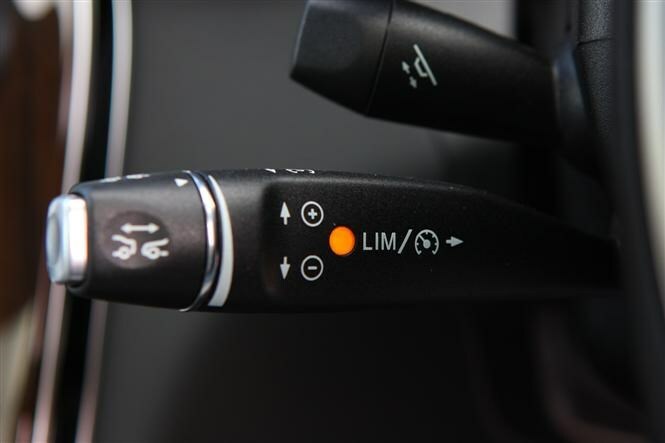 Since I’d driven a GLC before I didn’t need a huge amount of guidance, but if you’re completely new to the model then every single button can be explained if necessary. Multimedia came next, and Tom ran me through how to pair my phone to the COMAND Online system to unlock significant levels of functionality that we’ll examine in a later update. And then we had a chat about my time with the car. Tom explained that should the AdBlue additive need topping up before the next service was due, that would be complimentary – a nice little bonus because it costs more than diesel, and as we found with the Audi Q7, can need a refill fairly regularly. Incidentally, I’d need a service at either 15,000 miles or one year, whichever came first. I was ushered towards the service area next to meet a Service Technical Manager – my contact for all things related to the upkeep of ‘my’ car. By now it was time to hand over the keys, but there was one final touch that really made the experience memorable. 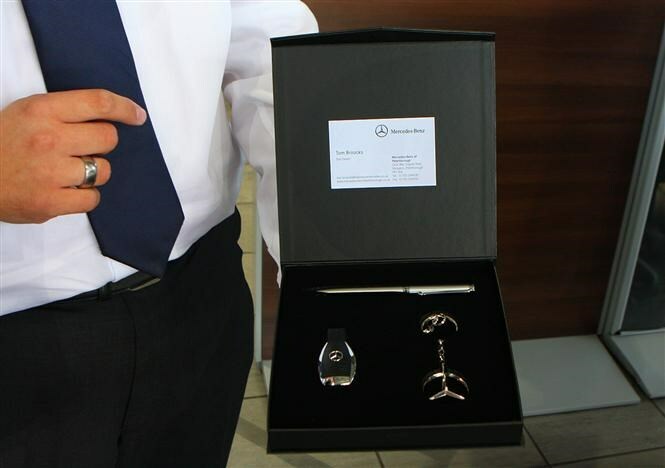 Tom ducked behind a screen and emerged with a gift – a branded set of keyring, USB and pen. 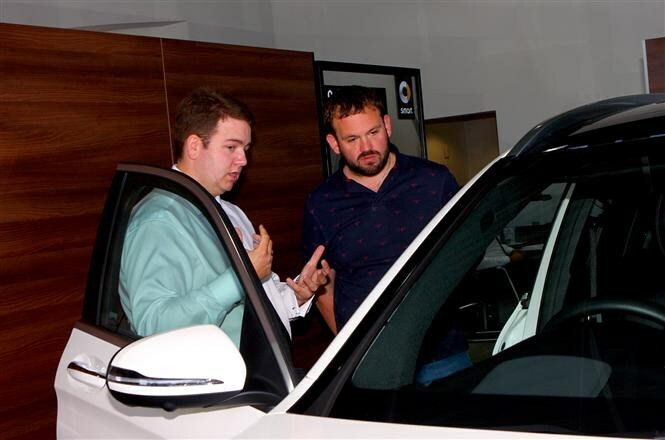 He explained this was common practice as a finishing touch to the experience, and quite often if not the Sales Manager then the dealership’s General Manager will hand it over. Finally it was time to drive out of the garage and begin my tenure with the GLC. Will used motoring throw up any peculiarities? Over the next six months I’ll endeavour to find out.